Aquariums and marine parks seem to spend a fair amount of time these days trying to convince us that their cetaceans live just as long in captivity as they do in the wild. The Vancouver Aquarium, which has seen four of its five captive-born belugas die prior to the age of 3, likes to remind us that the many threats to belugas in the wild means that they also die young in nature. Of course, this argument misses the point that in the captive environment, there are no such threats -- no shortages of food, no pollution, no risk of ship strikes, no predators; there's also health care to combat disease. So, in theory they should all be living much longer in captivity than in the wild. And, in fact, from time to time it does happen like that. 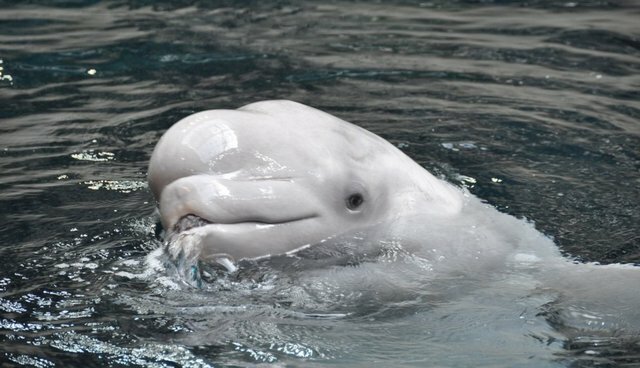 Take, for example, Kavna, the Vancouver Aquarium beluga that was the inspiration for Raffi's "Baby Beluga," a song well known to any Canadian under 40 years old. She lived to 46, a relatively ripe old age for any beluga, wild or captive. That's her in the photo above. The image, taken from a CTV news helicopter in 2012, shows Kavna, covered in a tarp, awaiting airlift from the tanks at Vancouver Aquarium just after her death. The Vancouver Aquarium, of course, is crying foul over its use by activists behind the anti-captivity website VanAquaFacts.org. The Stanley Park attraction has been strongly critical, claiming on their website that "It's a cruel and heartless misuse of an animal ... loved by millions of people including those who cared for her every day." The aquarium and its supporters also like to point to the use of this image as proof that activists' are somehow being dishonest, or are misinformed, given that this particular dead beluga lived such a long life. But again, they miss the point. Because, the real question is "What kind of life was it?" On July 27, 1976, Kavna was captured in waters near Churchill, Manitoba, in type of ‘hunt' that has since been made illegal in Canada due to its patently cruel nature. An innocent, majestic and free creature, Kavna was ripped from her natural environment and torn from her family unit. Two days later, at the age of 10, the adolescent beluga was introduced to the tanks at Vancouver Aquarium where she would live out the rest of her days. Kavna's world shrunk that day, from the vastness that is Canada's arctic waters to what is, by any measure, a glorified fish bowl. Moving to her new "home," all the beauty, variety and diversity of nature in the North's many inlets, channels and wide-open waters gave way to a lifeless, manicured, artificial world where not even the rocks were real. For any marine mammal, the natural tidal rhythms of the ocean must be as fundamental to them as is the movement of the sun through the sky to our species. Yet, for Kavna's entire adult existence these natural rhythms would be nothing but a distant memory of another life, before the Vancouver Aquarium. From the time she was captured until she died 36 years later, Kavna never again saw her brothers, her sisters, her parents and perhaps even children that she was forced to leave behind. Nor would she ever again hear the familiar voices of her family, with whom nature had meant for her to spend all her days, their calls replaced by the screech of a trainer's whistle. Her searching calls to them -- meant to travel across the miles of ocean -- would forever go unanswered, almost instantly reflecting back to her as a reminder how small her world had become. From the time of her capture until her death, Kavna would not feel the thrill of the hunt, dive deeper than a few meters nor taste the freshness of a live meal, her most basic of instincts replaced by hand-fed frozen fish as a reward for obeying a trainer's command. Kavna died a shadow of her former majestic, wild self, having been denied her most basic psychosocial needs and forcibly made to abandon her most deeply ingrained instincts. Robbed of her natural way of life and deprived of all contact with nature, her life was that of an exotic pet. The photo of a dead Kavna, partially covered and lying, undignified, on a concrete platform in the middle of the undersized tank where she resided for 36 of her 46 years is, for us, a potent symbol that points to the very heart of our opposition to cetacean captivity. For Kavna died just as she had lived: alone, without her family, in a tiny, sterile world she was not meant for, awaiting one last demeaning act to be perpetrated on her by those who claimed to love her.